Does the U.S. government want to outlaw cash? Be prepared for a war against economic freedom! The U.S. economy and jobs picked up dramatically in 2018, but so did market volatility! In 2019, wise investors should "prepare for the worst," according to former Fed Chairman Alan Greenspan. So, why the sudden rush to usher in a new "cashless society"? Governments have always had a love-hate relationship with cash because cash is anonymous money which may represent untaxed earnings. This helps explain why the fix is in to outlaw cash. * How to prepare for market volatility & slowing growth? * Why bankers must now spy on you for the U.S. Gov't? * Might the U.S. slip into a Recession in 2019 or 2020? * Which assets best safeguard your economic freedom? 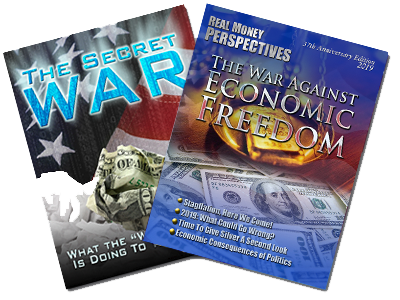 For the answers to these important questions Swiss America has just released two FREE Reports, The Secret War on Cash and The War Against Economic Freedom ... FREE now by calling 800-289-2646, or registering here.